Piero di Cosimo, who painted a number of important religious pictures, was a rather mysterious artist, his eccentric personality reflected especially in his paintings of strange animals and fantastic scenes. 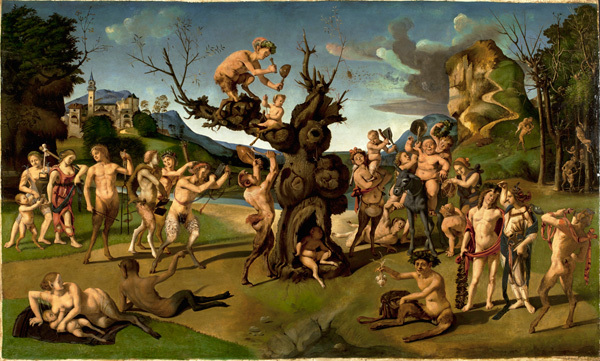 In this allegorical setting the mythological figures of Bacchus and Ariadne, in the right foreground, are accompanied by satyrs and maenads who make noise to attract a swarm of bees to settle in a hollow tree. The result is the discovery of honey, considered a step forward in the history of civilization which is symbolized in the background by the juxtaposition of an idyllic view of a town (on the left) and a wild and forbidding landscape (on the right). This painting resulted from the private patronage that developed in fifteenth-century Italy. Representative of a new demand for secular subjects, The Discovery of Honey by Bacchus is one of a pair of panels commissioned for the home of Giovanni Vespucci of Florence. The other, now in the Fogg Art Museum at Harvard University, is titled The Misfortune of Silenus.